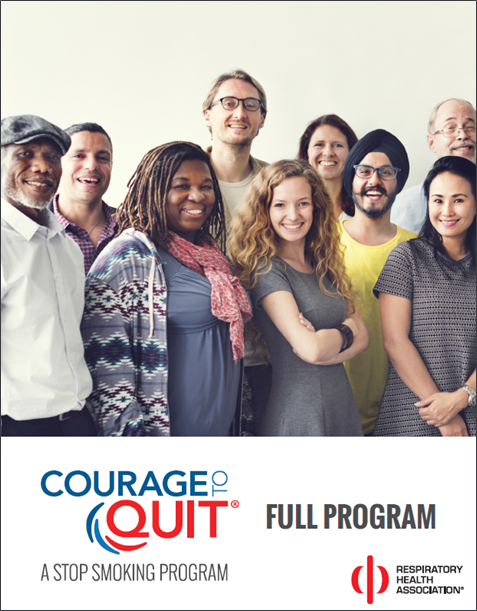 Courage to Quit® is an evidence-based group or individual tobacco treatment program for adults available in multiple formats with flexible content that can be customized for delivery. It is the cessation component of RHA’s integrated tobacco intervention program. Courage to Quit®’s effectiveness has been documented in the American Journal of Public Health. A smoker is more likely to pursue a quit attempt, with or without our program, when a health care provider uses Counsel to Quit® to encourage him or her. Research shows that on average it can take over six attempts before a smoker successfully quits for good. Trained and certified Courage to Quit® leaders work collaboratively with the individual to build on past attempts, create confidence, and develop their skills and readiness. After completing the program, participants report higher-than-average cigarette use reduction, quit attempt, and quit rates. Courage to Quit® is based on the work of Andrea King, PhD, a faculty member at the University of Chicago and licensed psychologist with a research background in tobacco and other addictions. Based upon proven methods for tobacco dependence treatment, trained and certified leaders provide information, practice skills, and support to help participants reach their smoke-free goals. Whether provided to individuals or in a group setting, the program is structured in six sessions, with the quit date scheduled for the third session. If you are looking to gain the knowledge and skills to assist people who are interested in quitting smoking, join one of our Courage to Quit® Leader Training workshops. The one-day, comprehensive training will prepare you to lead a group or one-on-one Courage to Quit® program. Learning styles and facilitation skills. The Courage to Quit® program is available in multiple formats with flexible content. As a leader, you will be able customize delivery for individuals or participant groups in health centers, community settings and/or workplaces. Current leaders include health educators, community health workers, social workers and other health professionals. Courage to Quit® leader training has been approved for nursing contact hours and continuing education hours for respiratory care practitioners and IAODAPCA. For more information about Courage to Quit® leader training, contact Lainie Kast via email at [email protected] or by phone at (312) 628-0241. Leaders from Illinois, Georgia, Pennsylvania, and Washington D.C. have completed Courage to Quit® training. Visit Courage to Quit® Adult Cessation Programs to find current local offerings.